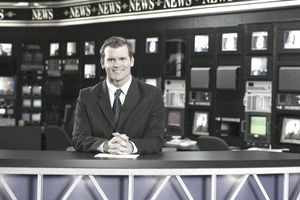 A news anchor, sometimes called a news analyst, presents stories on radio and television news broadcasts. Working for television and radio networks and local stations, they introduce reporters' videotaped and live reports, analyze and select stories, and interview guests. They sometimes broadcast from remote locations. News anchors are also required to have a presence on social media. News anchors' earnings vary by their location, experience, and sometimes name recognition. Those who work for large networks or stations in big cities like New York City, Los Angeles, Chicago, or Boston earn more than anchors do in smaller markets. Big name talent on major network news broadcasts or morning shows make more money than anchors without national name recognition who work for local stations. While there aren't any specific educational requirements for entry into this occupation, most employers prefer to hire job candidates who have a bachelor's degree in journalism or communications. College: To be a competitive job candidate, earn a four-year degree from a college or university. Major in journalism or communication, or a related subject. Training: While still in school, get experience by working on your student newspaper, or television or radio station. Do internships during the summer or immediately after graduation. Early Career: News Anchors typically begin their careers as reporters. Be prepared to relocate. You will have to go to where the jobs are. Verbal Communication: The better your ability to explain a story, the higher the chance the public will be able to understand it. Active Listening: As an anchor, it is imperative to be able to communicate with reporters while on the air, as well as with your sources. Writing and Editorial Skills: News anchors frequently are responsible for writing the stories they are covering, especially in smaller markets. If you start as a reporter, as is very likely, writing will be a primary part of your job. Social Perceptiveness: This skill will allow you to anticipate your viewers' reactions to stories and improve your coverage of them. Reading Comprehension: A great deal of written material will cross your desk, and you must be able to understand it. Ability to Improvise: There may be unexpected occurrences during live broadcasts. As the anchor, you will have to quickly and adequately respond to these events. Collaboration: Excellent interpersonal skills will allow you to function as part of the on-air team as well as work well behind the scenes. Expect stiff competition for jobs. The Bureau of Labor Statistics (BLS) predicts little or no growth in employment for news anchors between 2016 and 2026. Employment of reporters will decline by 10% during that period. Since aspiring anchors typically break into the business as reporters, entering the news broadcasting field will be challenging. Make yourself a more competitive job candidate by getting a lot of experience while in college. Those who have completed internships and worked for college news outlets, including newspapers, and radio and television stations, will be the most desirable applicants. Source: Bureau of Labor Statistics, 2017. News anchors spend much of their day in an office, preparing for broadcasts. At times, their work puts them into unpleasant or uncomfortable situations. Some anchors cover stories from dangerous or remote locations. News anchors often work early mornings, weekends, and holidays. Some work overnight shifts. The race to be the first on the air with breaking news means anchors will have to show up for work on short notice. Visit network and broadcast company websites to locate jobs and internships. General job search listings like Indeed.com can alert you to current job listings. Also, use niche sources for the broadcast field. Good ones are MediaBistro, Radio Television Digital News Association Career Center, UC Berkeley Graduate School of Journalism: Journalism Jobs & Internships, and JournalismJobs.com.